‘A series of accidents has brought you this book. You may think of it not as a book, but as a library, an elevator, an amateur performance in a nearby theatre. Open it to the table of contents. Turn to the page that sounds the most interesting to you. Read a sentence or two. Repeat the process. 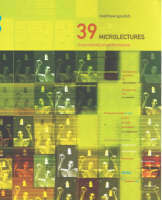 Read this book as a creative act, and feel encouraged.’ 39 Microlectures: In Proximity of Performance is a collection of miniature stories, parables, musings and thinkpieces on the nature of reading, writing, art, collaboration, performance, life, death, the universe and everything. It is a unique and moving document for our times, full of curiosity and wonder, thoughtfulness and pain. Matthew Goulish, founder member of performance group Goat Island, meditates on these and other diverse themes, proving, along the way, that the boundaries between poetry and criticism, and between creativity and theory, are a lot less fixed than they may seem. The book is revelatory, solemn yet at times hilarious, and genuinely written to inspire – or perhaps provoke – creativity and thought.